A Jerry Can at the LTD filling station at the corner of Grove St and Davis Ave in GTA V.
The Jerry Can is a weapon in Grand Theft Auto V.
The jerry can is a robust steel fuel container which holds 20 litres (approximately 5.3 U.S. gallons) of gasoline. The player can pour a trail of gasoline and ignite it using any source of flame or spark. Typically, shooting the trail is the most common method; however, the player can use a Molotov Cocktail or the backfire of exhaust to ignite the trail. Any target caught in the burning trail will be engulfed in flames. 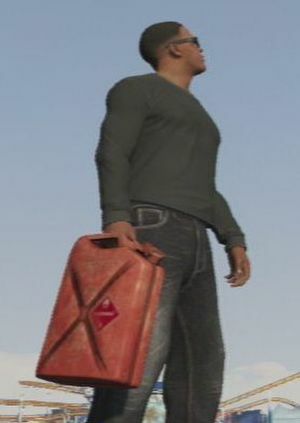 If the player catches on fire while holding the jerry can, it will explode, and the player will take significant damage, depending on the amount of fuel remaining in the can. Jerry cans can either be bought at Ammu-Nation for $25 or found at certain gas stations across San Andreas. Gas remaining in the can is measured by a percentage; 5% represents one litre of gasoline (around 19% represents one U.S. gallon). Based on the normal (i.e. non-discounted) cost of a jerry can at Ammu-Nation, gasoline in the state of San Anderas costs $4.72 per U.S. gallon ($1.25 per litre). This page was last modified on 25 November 2014, at 16:27.